Move over, New York. 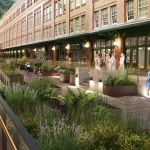 Earlier this month, developers McKnight Realty Partners held a ceremonial groundbreaking for the Highline, Pittsburgh’s newest mega-conversion. 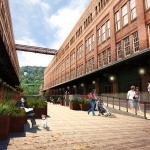 Developer McKnight Realty teamed up with local firm Indovina Associates Architects to redevelop the Pittsburgh Terminal Warehouse and Transfer Company (map) on the city’s deindustrialized South Shore. The $110 million complex will bring 600,000 square feet of office and retail to the area. The building—they are one, but appear to be two—is connected by a five-hundred-foot-long elevated roadway that will be converted into a park-like space with lighting and seating. 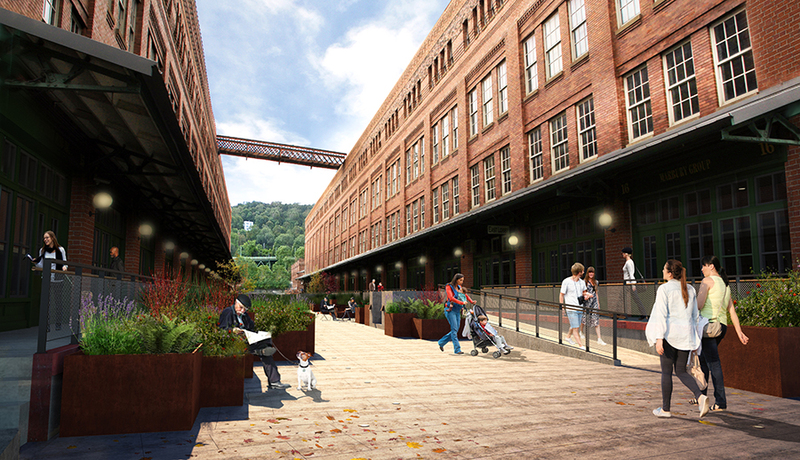 The walkway will be extended to the abutting Monongahela River and face north towards the city’s Downtown. 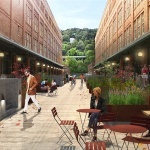 Similar in name and form to Manhattan’s High Line, which brought a disused freight railway line back to life as a public park and spurred a development boom on Manhattan’s Far West Side, Pittsburgh’s Highline project seeks to revitalize a significant site within the city’s post-industrial landscape. Indovina’s design incorporates vegetative and hardscaping features, such as raised planters and textured concrete pavers. 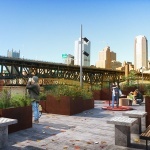 Below the Highline, and along the facility’s loading docks, there will be a lower park dubbed the Yards which will serve as an extension to Pittsburgh’s preexisting river trail system. Restoration is key to the project. Notably, all of the complex’s damaged windows will be replaced with historically accurate units and both the cast-iron detailing and brick curtain walls will be entirely restored. Completed in 1906, The Terminal Building was designed by prominent Pittsburgh architect Charles Bickel. 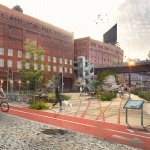 Like the former warehouses adjacent to Manhattan’s High Line, the facility was designed to integrate freight and warehousing logistics in an urban setting. 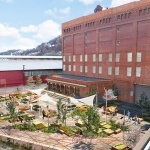 The conversion of The Terminal Building joins Pittsburgh’s ongoing restoration and construction trend that has brought similar warehouses back to life, such as the city’s Produce Terminal and the Allegheny Riverfront Green Boulevard. The Pittsburgh Tribune reported the project will receive approximately $17.5 million in federal and state financial incentives, and construction should be complete by 2019.